"...the fruit of the tree which is in the midst of the garden" is a reference in the Old Testament to that tree which has become known as the "tree of knowledge." 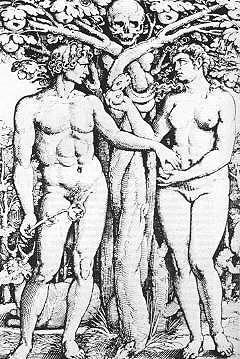 In the Garden of Eden man was given a choice between this tree, which conferred mortality on mankind, and the tree of life, which granted immortality. 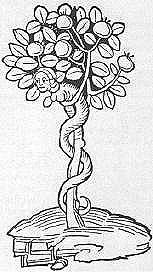 Given no other indication, artists and writers have envisioned the tree of knowledge as an apple, a fig, a pear, dragon's blood, and a banana tree! The most bizarre interpretation comes from a 13th century cathedral in Indres, France, which contains a fresco showing Eve encountering a female serpent entwined around a giant branching mushroom common in Europe - the slightly toxic and hallucinogenic Amanita muscaria.